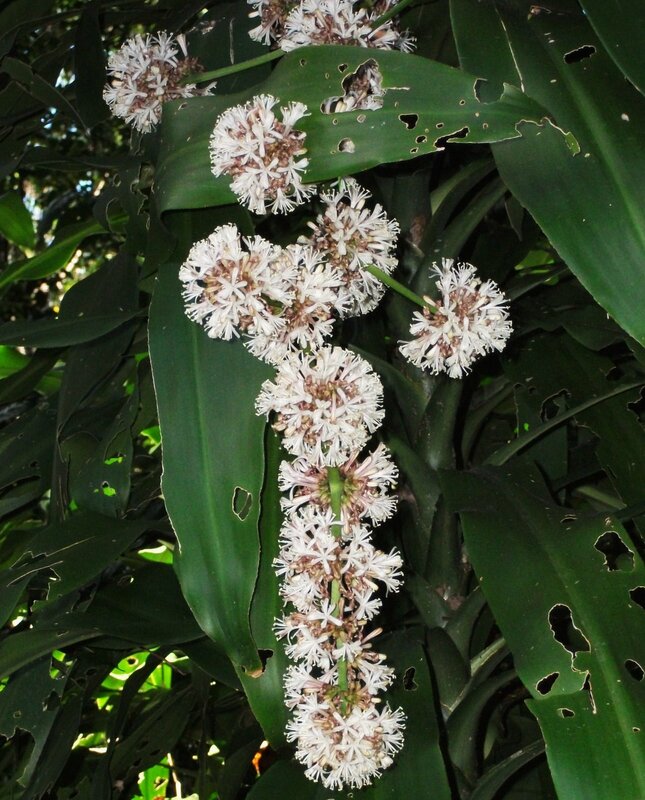 Distribution and habitat: Dracaena fragrans is a flowering plant species that is native throughout tropical Africa, growing in upland regions at 600–2,250m (2,000–7,380 feet) altitude. Description: Dracaena fragrans is a slow growing shrub, usually multistemmed at the base, mature specimens reaching 15m (49 feet) or more tall with a narrow crown of usually slender erect branches. Stems may reach up to 30cm (12 inch) diameter on old plants; in forest habitats they may become horizontal with erect side branches. Young plants have a single unbranched stem with a rosette of leaves until the growing tip flowers or is damaged, after which it branches, producing two or more new stems; thereafter, branching increases with subsequent flowering episodes. The leaves are glossy green, lanceolate, 20–150cm (8–59 inch) long and 2–12cm (1–5 inch) wide; small leaves are erect to spreading, and larger leaves usually drooping under their weight. The flowers are produced in panicles 15–160cm (6–63 inch) long, the individual flowers are 2.5cm (1 inch) diameter, with a six-lobed corolla, pink at first, opening white with a fine red or purple central line on each of the 7–12mm (0.3–0.5 inch) lobes; they are highly fragrant, and popular with pollinating insects. The fruit is an orange-red berry 1–2cm (0.4–0.8 inch) diameter, containing several seeds. Houseplant care: Dracaena fragrans grows well as a houseplant in nearly any location. It only requires minimal care to produce deep green foliage and lush growth. 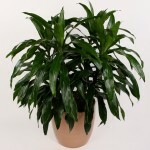 Light: Dracaena fragrans enjoys medium light but can tolerate low light conditions. New leaves will narrow if there isn’t enough light and direct sunlight will bleach the leaves. In extreme cases, Dracaena fragrans is a great plant for low-light conditions. Water: During the active growth period water plentifully, as often as necessary to keep the potting mixture thoroughly moist, but never allow the pot to stand in water. During the rest period water moderately, enough to keep the potting mixture barely moist, but allow the top centimetre or so to dry out between waterings. Keeping Dracaena fragrans too dry will result in brown leaf tips. Dracaena fragrans is not suitable for low humidity spaces. If the humidity drops below 40% for an extended time, the tips of the leaves can turn brown. Try misting the plant every day to provide humidity. Dracaena fragrans is also sensitive to fluoride and excessive salts, so try to use nonfluoridated water and flush monthly to remove fertilizer salts. Temperature: Not suitable for cold conditions. Cold damage may appear on leaves if temperatures drop below 10oC (50oF). They do best in 24 to 27oC (75-80oF). Growth may cease completely below 21oC (70ºF), but will resume when warmer weather returns. Soil: Dracaena fragrans can use loose, well-drained potting mix. Fertilizer: During growing, fertilizer with slow-release fertilizer or use a liquid fertilizer at half-strength every month. Iron deficiency can result in yellowing leaves between the veins—treat with an iron drench. Potting and repotting: Dracaena fragrans grows well in any type of pot that contains drainage holes in the bottom. A standard potting soil for indoor tropical plants retains sufficient moisture without easily becoming soggy. The mixtures typically contain loam, peat moss and vermiculite or perlite. A drip tray placed beneath the pot collects excess water and requires emptying after each watering. Pot size varies depending on the size of the plant. Dracaena fragrans requires repotting when the root ball fills the pot and the plant either begins to lift or send roots out of the drainage holes. Repotting into a pot one size larger every two to three years in late winter is usually necessary until maximum convinient pot size (probably 20-25cm (8-10 inch)) is reached. Pruning: Dracaena fragrans rarely requires severe pruning. It produces canes, which you can cut back to the desired height if the plant becomes overgrown. Pruning is typically done in the spring but you can prune it any time the plant is actively growing. Leaves occasionally yellow and die. Remove these at any time to improve the plant’s appearance. Propagation: Dracaena fragrans is propagated by cutting segments of old stems 10–20cm (4–8 inch) long. These are allowed to dry off, and then inserted into moist sand until they have rooted. They should root within a month. New growth, typically two or three shoots, comes from old leaf scars at the top of the stem. 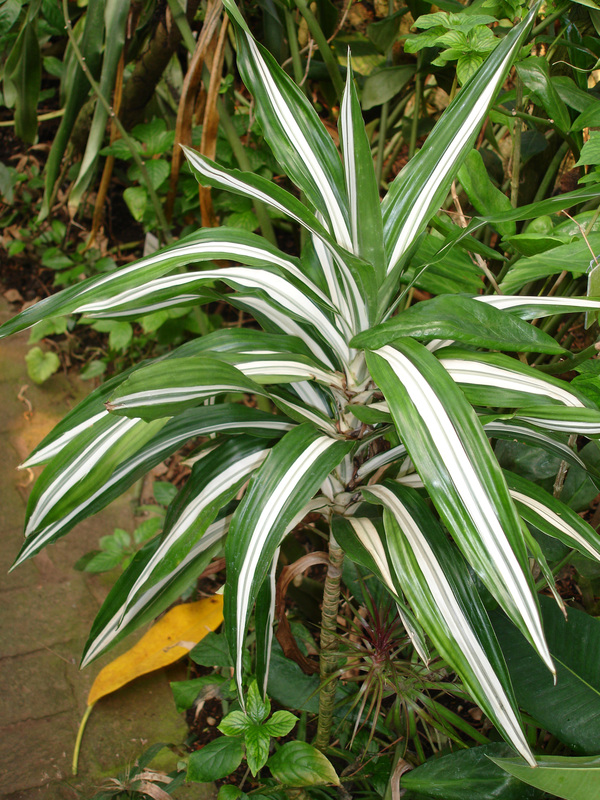 Dracaena fragrans (Dracaena deremensis) ‘Warneckii’ features stiff leaves that are striped in gray, green, or white. There are several popular cultivars of Warneckii, including ‘Lemon Lime’. Dracaena fragrans (Dracaena deremensis) ‘Janet Craig’ has solid green, flexible leaves. The ‘Janet Craig Compacta’ is smaller in appearance, but has much smaller (less than 8 in.) leaves. Uses: Dracaena fragrans is used as specimen plant, container or above-ground planter, border or suitable for growing indoors. 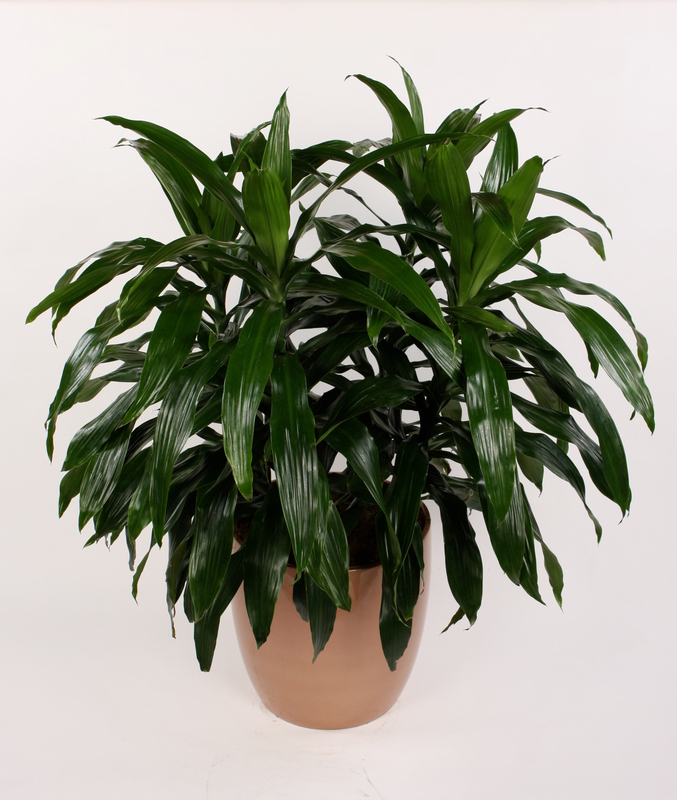 Dracaena fragrans is suitable for low-maintenance container culture or specimen planting in the shaded landscape. 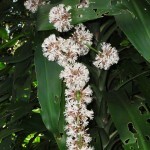 Dracaena fragrans is widely grown as a hedge plant. Indoors, it works as single windowsill plants or as part of a mixed group, with their various leaf patterns complementing and overlapping one another. 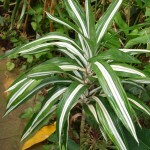 The white striped and variegated cultivars can brighten a shaded yard or dark corner. 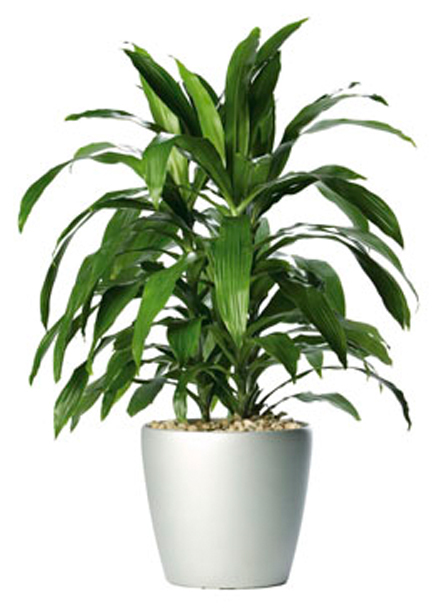 Dracaena fragrans is said to be a good overall air purifier, removing most air pollutants. Known for removing trichloroethylene, a chemical found in many solvents, dry cleaning solutions and refrigerants. Also said to remove benzene, a carcinogen. Problems: Dracaena fragrans are susceptible to thrips and mealybugs.